The revolutionary Fusion line by Federal Premium Ammunition is a high-end cartridge for hunting white-tail deer, hogs, and other game. Fusion’s signature feature is a jacket that undergoes electrochemical “fusion” to the bullet core to eliminate catastrophic core-jacket separations that can render a bullet ineffective. Combine this innovation with a reliable-feeding flat nose soft point design suitable for tubular magazines and you have a potent hunting cartridge for the Winchester 1894, Savage Model 99, and Marlin Model 336 and other firearms chambered in .30-30. 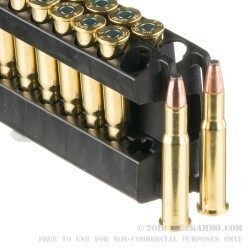 Each box contains 20 cartridges in Boxer-primed reloadable brass. Expect a muzzle velocity of around 2200 feet per second with these rounds. 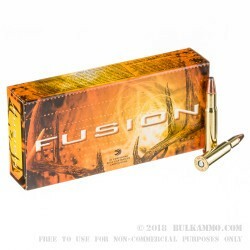 Federal Premium Ammunition’s Power-Shok and Fusion lines are a staple for hunters all over the United States. The company has extensive experience in designing expanding ammunition in the personal defense market as the developer of HST and Hydra-Shok. Federal belongs to defense manufacturing conglomerate Alliant Techsystems but continues to operate out of its longtime headquarters and production plant in Anoka, Minnesota. Q: Does this use Federal's projectile or are they using 3rd party? 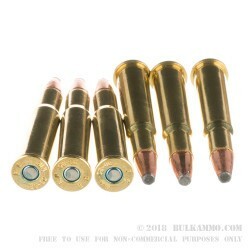 A: Yes, these Federal .30-30 cartridges use Federal's Fusion projectile design. The "Fusion" name refers to the bonded nature of the jacket to the core, which allows higher weight retention after impact. Thus, it is ideal for hunting applications.